I had a Microsoft Surface RT tablet in the shopping cart. I was this close – holding my thumb and index finger very close to each other – to pulling the trigger. Had the trusty credit card out and permission from the spousal unit. What’s not to like about Surface RT? I believe it’s a more sophisticated option than either an iPad or Android tablet. The starting price is $499 for a 32 GB model with 10.6-inch ClearType HD screen, five-point multi-touch, resolution of 1366 x 768, a NVIDIA T30 chip paired with 2 GB of system memory, MicroSD card slot, USB 2.0 port, HD video out port, has a kickstand and so on. It even includes Microsoft Office 2013 Student Edition for crying out loud! And if you’re willing to drop a bit more cash you have options for a keyboard cover. It’s truly a bargain. So what’s the problem? There’s really no problem. I want one. I really want one. The issue is that I made a deal with myself a month or so ago that I wouldn’t purchase another piece of technology unless it could replace something I currently have. I have a lot of toys. And unfortunately the Microsoft Surface RT won’t replace any of the bigger ones because it runs an ARM-based chip that typically powers smartphones and consumer tablets. It could easily replace an iPad or Android tablet, but not my laptop or tablet PC. I suppose it could in theory, but not practically. Being the logical guy that I am I’ve decided to wait for Surface Pro and shell out the $1K plus in the hope of replacing at least one of my bigger machines. That’s the plan anyway. You never know though. I’ll be in up in Bellevue, WA next week, which means that I’ll end up at the Microsoft Store at least once. 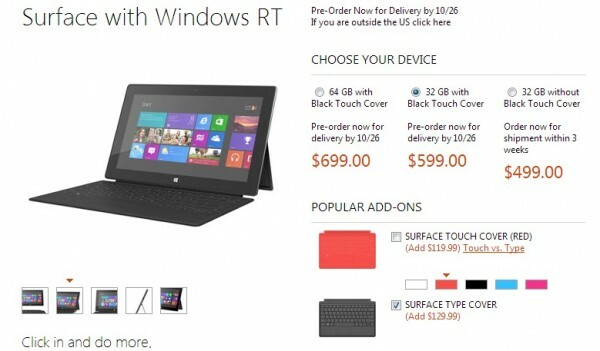 I wouldn’t be at all surprised if I ended up walking away with a Surface RT tablet. Just sayin’. I am waiting with ya Jerry! If the Surface RT gets good reviews it makes the Pro all the more more appealing. I will preorder the minute it is available, in hopes of replacing my Macbook Pro with a lighter, more versatile piece of hardware.